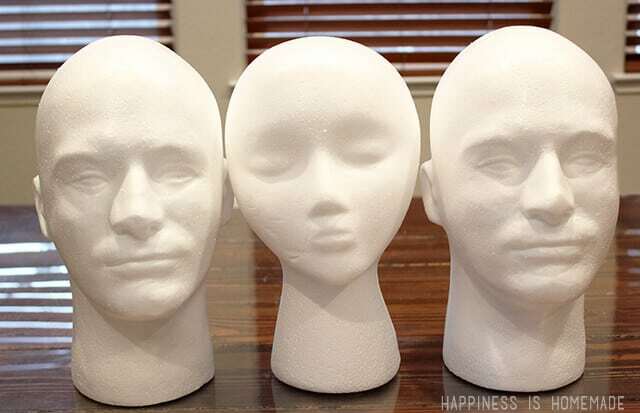 We recently received a big box of FloraCraft® Foam Heads (available at Michaels and JoAnn stores), and at first I was a little stumped about what I wanted to make with them. I contemplated making Halloween props for our outdoor decorations, but since we had already finished decorating for this year, I wasn’t sure where I could fit them into the scheme. 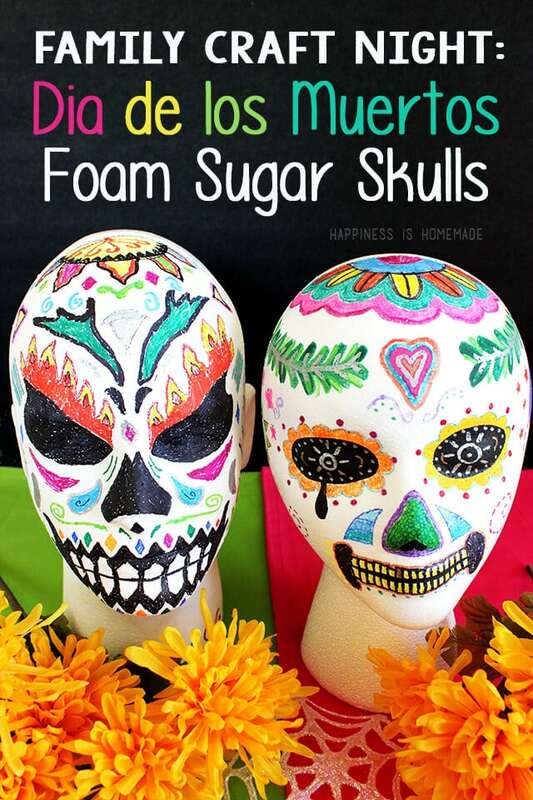 One morning while we were learning about Dia de los Muertos during our homeschool social studies lesson, my boys came up with the brilliant idea of turning the heads into foam Dia de los Muertos sugar skulls, and a family craft night activity was born. 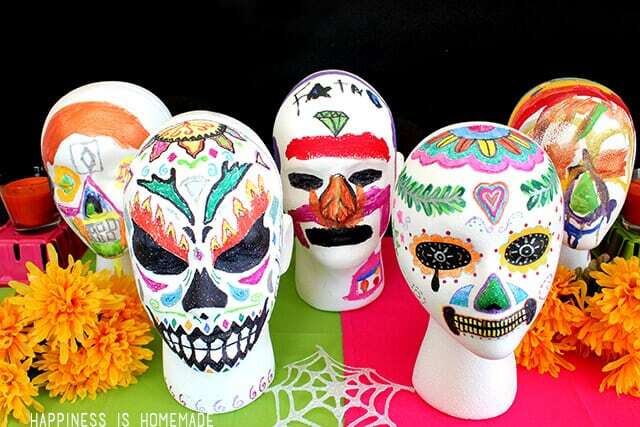 We each chose a foam head to decorate and then searched for sugar skull images on the internet for inspiration. 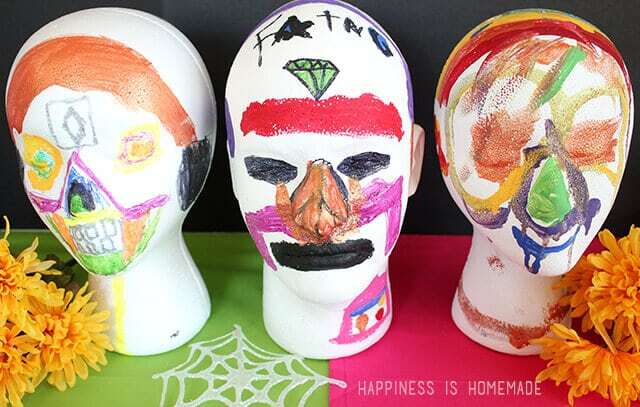 We discovered that acrylic paint and Sharpie both markers worked well for decorating the heads. The paint provided a smoother and more uniform appearance on the styrofoam, but was slightly messier and involved drying time before we could add additional details. In the end, most of us used a combination of paint and markers to keep the creative process flowing. I have to admit that this while this activity was a TON of fun, it was also really difficult for me since I’m so indecisive! I started by painting my eyes and a mouth, and then I got stuck. There were just TOO many possibilities! Creepy or cutesy? Pretty or spooky? Ack! Where do I begin? 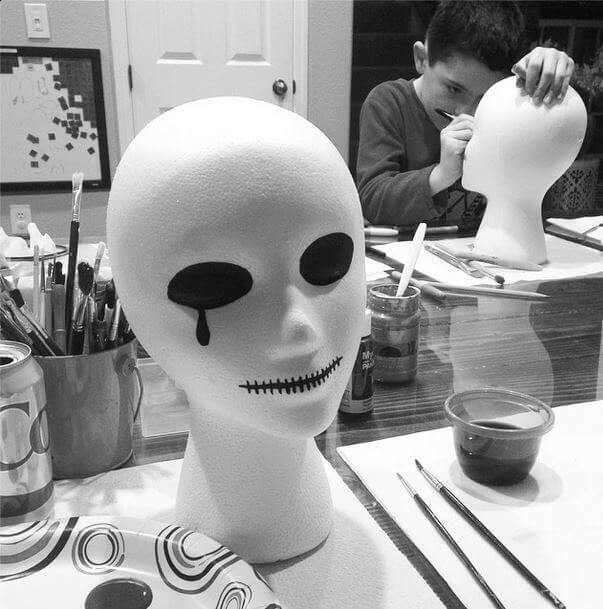 Fortunately, my kids are far more decisive than I am, and they had no problem jumping right in and implementing their design ideas. Each one of them had a definite idea of what they wanted to create, and they had SO much fun with it! 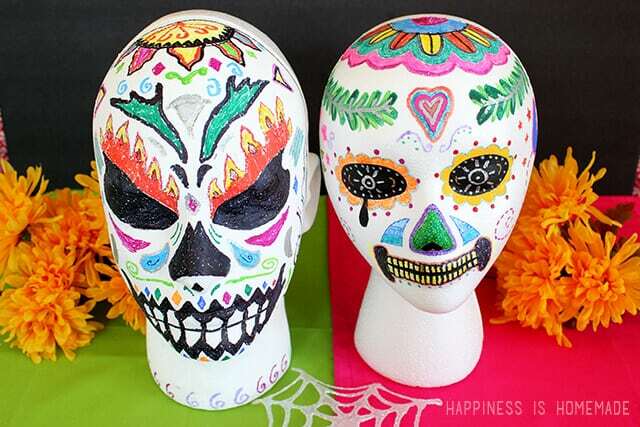 I picked up a paint brush and started “doodling” on my sugar skull, but I still wasn’t really thrilled with where my design was going. My husband was busy creating an awesome sugar skull of his own and having a blast with the process, so after he finished up, I passed my in-progress skull over to him to complete for me. Clearly he was much better at this project than I was! I love the way they turned out! 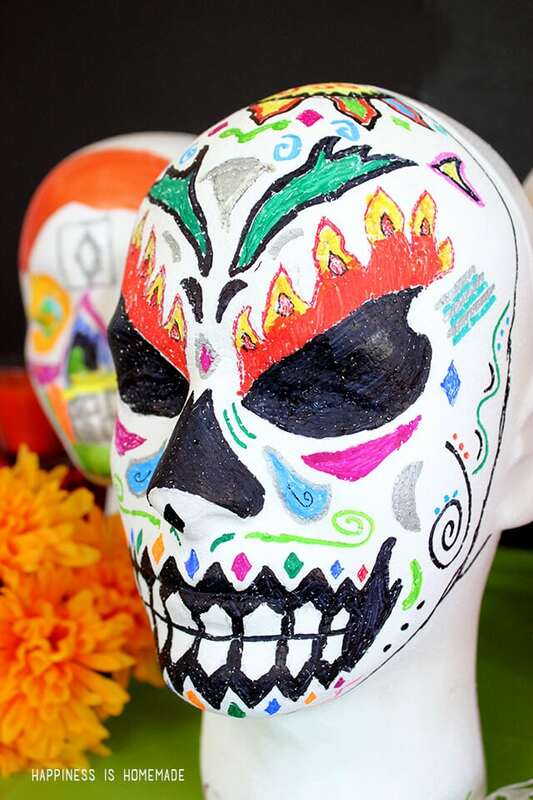 I probably would have never thought to finish up my sugar skull the way that my husband did, but I’m so happy that I let him do it for me. The boys are pretty thrilled with theirs, too! 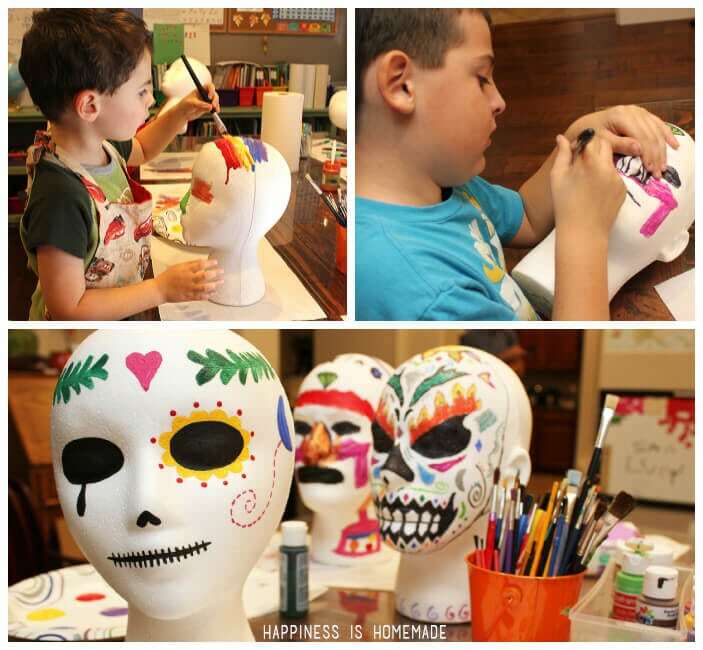 We had such a great time with this Dia de los Muertos family craft night activity that we’re already brainstorming ideas for our next one! 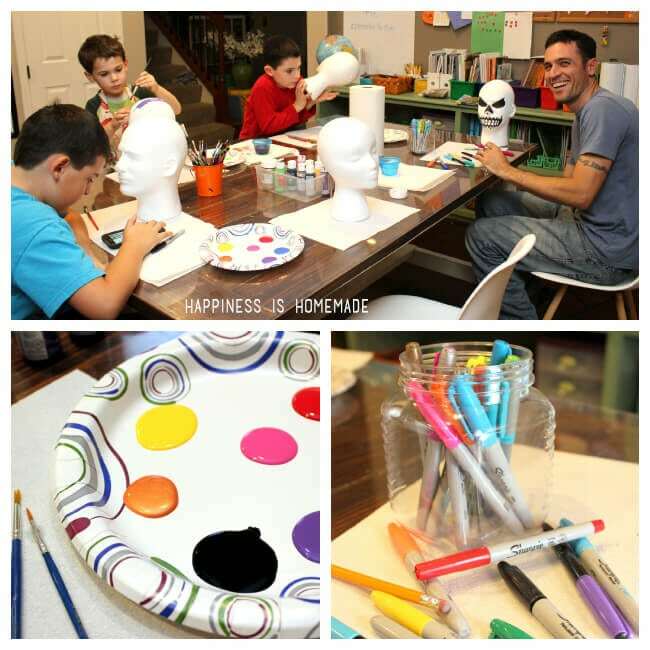 Thanks so much to FloraCraft® for providing us with the foam heads that made our family time such a great success! This is such an awesome idea! I love how you used these as a hands-on, multi-cultural learning experience. Your kids did a great job, too! Thank you.